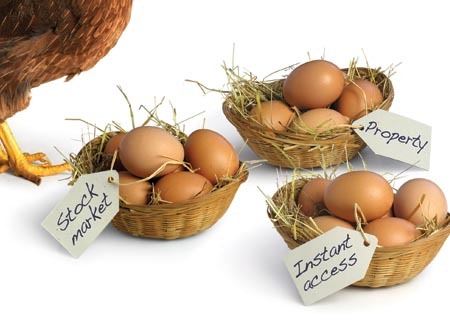 The first guideline that any investor should adhere to is to not put all your eggs in one basket. And the greater the uncertainty in the market, the more important this rule becomes. In general, everyone should try to own some precious metals, some stocks, some real estate and some money in a long-term savings account. You should also diversify within each of these categories. The distribution of your portfolio between the four categories listed above will depend on the current state of the market. In general, precious metals and savings are more defensive while stocks and real estate are more offensive. You will also find a range of options spanning from defensive to offensive within each of these categories. Gold is significantly more defensive than silver for example. And yes, in very uncertain economic times such as these, you want the bulk of your portfolio in gold and savings, while still keeping some stocks and real estate as a hedge against unexpected good times. Your distribution between offence and defense will also depend on your investment horizon – how many years you plan to keep your money in a specific investment. All investments go up and down with time (even savings accounts as interest rates and inflation rates fluctuate over time), but a longer investment horizon will allow you to absorb much more volatility (fluctuation) than a shorter horizon. Therefore, if you are still young and you are not even thinking of retirement yet, you can invest more aggressively, but if you are older and have a shorter investment horizon, you have less leeway for taking risk. Remember that your most precious asset is nothing other than your own body/mind. Your ability to add value to your community is your ticket to the wide range of goods and services produced by others. The more value you can produce, the greater the potential returns you can reap from your most precious asset.